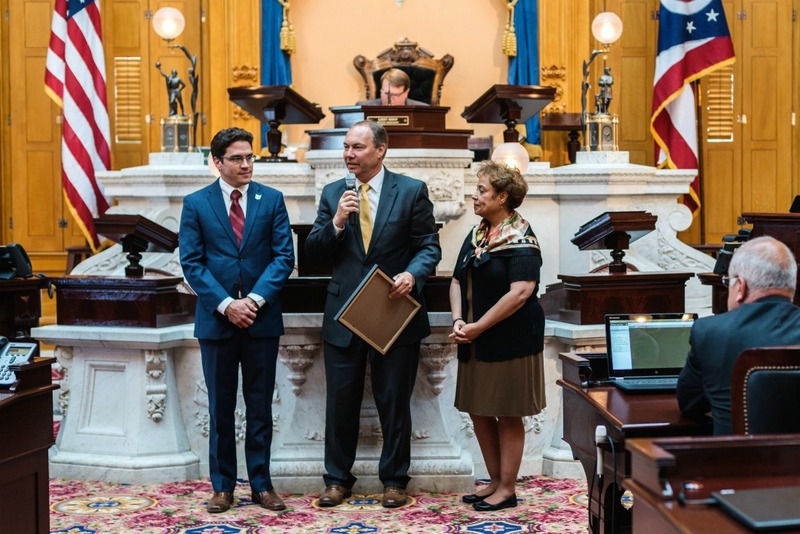 On Wednesday, State Senator Bob Peterson (R-Washington Court House) recognized Dr. Brian Santin, a vascular surgeon at Clinton Memorial Hospital in Wilmington, on being named the Ohio State Medical Association's Physician Advocate of the Year. "Dr. Santin is an invaluable resource for information on health care policy and someone who lawmakers from both political parties can look to for straightforward counsel on ways we, as a state, can improve health outcomes for Ohioans," Peterson said. "We are especially proud that he has chosen to practice medicine at our very own Clinton Memorial Hospital in Wilmington." A vascular surgery specialist, Santin graduated with honors from Ohio State University College of Medicine in 2006. Physician advocacy plays a crucial role in promoting the health care industry as issues move through the policymaking process. In a society confronted with pressing issues such as affordability and access to health care, physician advocacy is of critical importance. The physician advocate goes beyond their primary role of providing clinical treatment to their patients by advocating for the well-being of their profession, patients and communities in which they serve. The OSMA Physician Advocate of the Year Award is presented each year during the OSMA’s Annual Meeting.